Music Theme Park: Alert: Bill Wyman's Scrapbook. 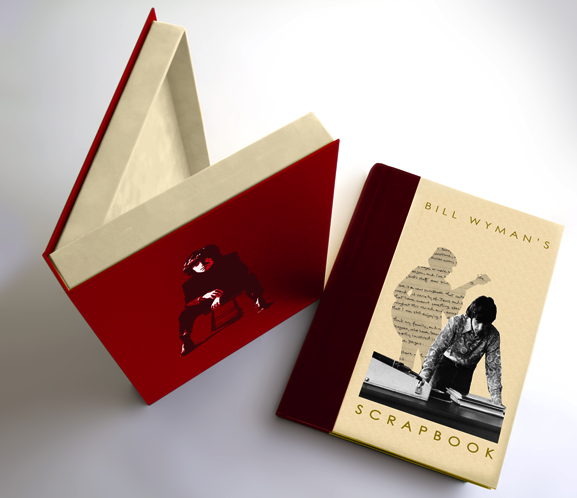 The majority of the book's content is unseen, revealing a deeply candid and original insight through the decades, with reflective hand written commentary by Bill Wyman. Hand sewn and hand bound in England using the finest materials and traditional binding methods - made to last. Built into the back cover, a 10" picture vinyl will be included, with rare and unreleased material from over the years. Includes previously unheard demos of Bill's No.1 hit 'Je Suis un Rock Star ' (a track he originally wrote for Ian Dury) and 'Come Back Suzanne'. More than 1,000 of the limited run book have been pre-ordered. The remaining 962 are available for £229 plus international postage (approximately $350 US) and are available here.